Virtualization refers to the act of creating a virtual version of something, like a virtual operating system, a virtual software, a virtual computer hardware, a storage devices, computer network resources etc. This tutorial will take you through a step-by-step approach to learn Virtualization concepts. This tutorial has been prepared for beginners to help them understand basic concepts related to Virtualization. This tutorial will give you enough understanding of Virtualization concepts from where you can take yourself to a higher level of expertise. Rushi Panchal left his blooming career in top IT Giants to follow what he love doing most, inculcating knowledge and compassion in the younger generation. Born into a family of educators, Rushi’s love for teaching started early in his life and his vast exposure helped his own journey from the classroom to online teaching. 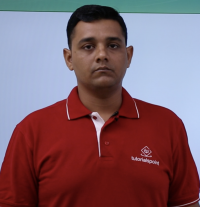 Rushi Panchal has a Master's and Bachelor's degree in Computer Science, both from the Veer Narmad South Gujarat University.He Expert in 3d Animation, Visual EffectzCloud Computing and Software/App Testing. He also work in Hindi Web/TV Series as a 3d Animator and VFX Artist.